For close to 40 years, Thomson Medical has assisted many women Celebrate Life into motherhood. Breastfeeding is an ongoing journey that requires preparation and emotional support from your family. We understand that many women face frustrations in breastfeeding their infant, primarily due to a lack of mental preparation during their pregnancy phase. This specially curated programme features Dr Yang Linqi, Dr Wong Boh Boi, and Ms Fonnie Lo. These 3 experts are proud mothers who have experienced breastfeeding and have educated thousands of mothers on the importance of breastfeeding. 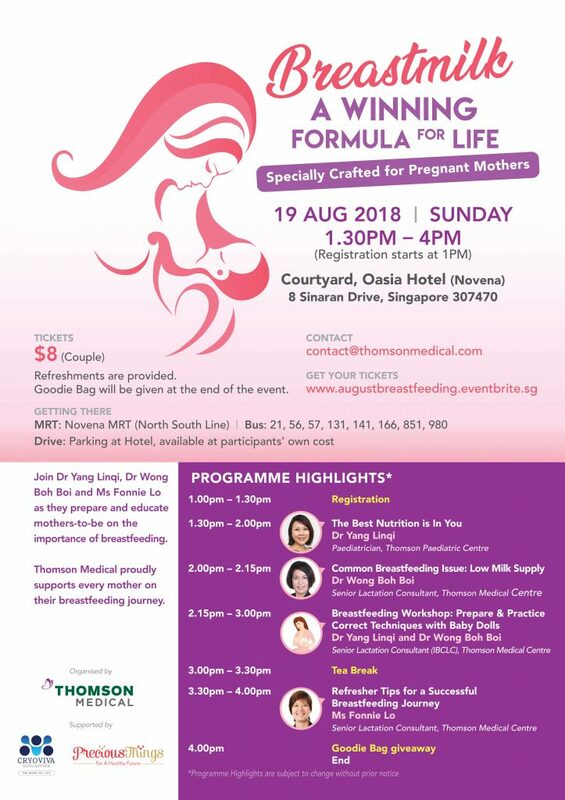 The trio has put together a focused programme for mothers-to-be, in confidence that this course will prepare & strengthen their mindset to breastfeed. Limited seats are available for 19 AUG, SUNDAY, do book your tickets early!. Thomson Medical proudly supports all mothers in their breastfeeding journey.